Looking for ways to lead people into your sales funnel? Do you want new ways of targeting customers apart from costly ads? Twitter might be your answer. At the end of 2017, Twitter is expected to have over 255 million active users. This means that Twitter is a platform where you’ll (most likely) be able to find people who can be interested in your brand. Implement Twitter successfully in your marketing strategy and you’ll be able to identify and target people who can mean business for your brand. Now, before we begin, it’s important to point out that Twitter isn’t a platform for all businesses. And this boils down to how you choose social platforms you are active on – where your target audience is to be found. If your audience doesn’t spend its time on Twitter, then obviously, it’s not a platform that you should be spending time on. 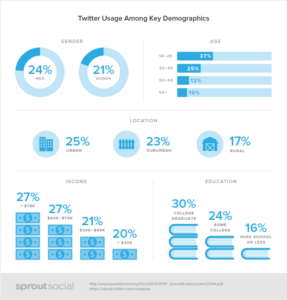 Before we begin, let’s look at the demographics of Twitter. This will let you know if you should continue reading or not. And if the information in this article will be valuable to you. Does your audience fit in this frame well, or somewhat well? Twitter ads are the most obvious and simple way to reach your target audience. At least if you have the money for it. But luckily, Twitter ads aren’t actually that expensive. 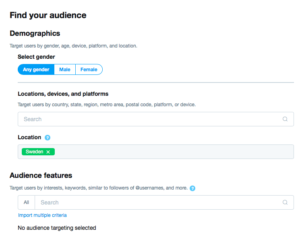 And best of all: The targeting features of Twitter when setting up an ad lets you target exactly the people you imagine being your ideal customers. When you create an account, you want to reach the people who truly matter to your brand, and are likely to convert. However, no matter how targeted your campaign is, you won’t only reach people that are deadly interested in your brand and that will convert on the spot. But that’s where your campaign comes in. No matter if you are running ads or not, your campaign and your content will affect the people you’ll attract. Let’s say you are a business who sells yoga mats and want to do a giveaway to gain traction, and you use Twitter ads to help amplify your message. Your targeting will do a lot, but the structure of your giveaway will also do a lot. In other words: if you in your giveaway give away $1000 dollars in cash, you’ll attract everyone! Money is not a niche product that is only relevant to a few people. It’s relevant to everyone. This means that you’ll attract a ton of people and get amazing results (on paper), but the real truth is that only a small fraction of the people who joined only joined because they wanted the cash and not because they were interested in your business. However, if you, instead give away a yoga mat, you’ll only attract the people who care about yoga and really want a yoga mat. This means that you’ll appeal only to your target audience, and potential customers. This is what will have a huge effect on how well your ad performs because it has 100% control whether you are going to reach the people who are truly your potential customers or not. A great and simple way to find people who are your potential customers is by spying on your competitors. This is something that can be done on every social media platform so keep it in mind for future efforts on other platforms as well. The method is really simple and the idea behind it is to review which individuals are engaging with your competitors. You and your competitors have the same target audience because otherwise, they wouldn’t be your competitors, and this means that if you can identify the customers and the people who are interested in your competitor’s business, you can find people who are likely to have an interest in your brand as well! This is the most basic step to finding people by looking at your competitors. The process is simple. Go to their Twitter account and tap on followers. Here, you’ll be presented with a list of all the people who are following that account. While this isn’t a 100 percent accurate method to find people who are your potential customers, it’s a relatively easy way to find people who at least probably have an interest in your industry – and that’s a start. If I was Pepsi. Then maybe I’d go to Coca-Cola and checked out the people who followed them and engaged with them, getting them aware of my existence. Another way you can spy on your competitors is to look at tweets that people are doing about that brand. For example, if you can find people who are interested in the Pepsi brand, you might be able to convert them into trying out Coca-Cola by finding the people who are talking about Pepsi and then interacting with them in an engaging and personal way. To find the people who are talking about your competitors, you can use two methods; hashtags and keywords. I’ll go into detail on each of those further on, so I won’t bother doing so right now. But what you need to know is that by finding people who are talking about your cope tiros, you are identifying people who are interested in that industry/product/niche and therefore are able to identify your target audience in a simple way, by taking a shortcut and piggybacking on your competitors. By looking at trends related to your niche, you can use another approach to identifying your brand’s prospects. When people are taking part of trends in your industry, you can be quite sure that they are actually interested in your niche, and thus are likely to want to buy from you. A simple way to stay updated with trends in your industry is to look at trending topics and hashtags that Twitter present to the left of your feed. Of course, if you re within a small niche, chances are that trends in your industry will never be presented there, however, if that is the case, you could specifically search for keywords related to your industry (but more on that later). 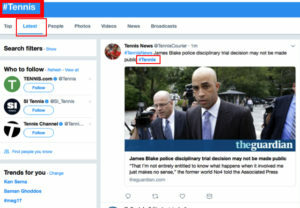 Twitter offers both tailored trends and regular trends.Tailored trends are based on your interests and what topics Twitter believes you’ll find interesting, so in that sense, it isn’t impossible to get trending topics in your industry displayed in the list to the left of your feed. 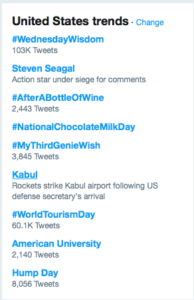 You can also choose to change your trends by choosing “change” to the right of the headline. This will allow you to search for trends in particular locations’ and if you know there’s an event in your industry going on right now, this can be especially helpful in finding people who are posting about it that you can engage with. Twitter’s Advanced Search function lets you search for relevant comments so you can easily find potential customers. Of course, this tool has zero limitations and can be used in a million different ways, but in this case, we’re going to use it to identify prospects for your business. 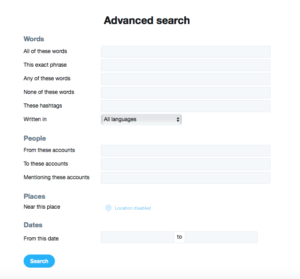 By finding Tweets by people who might be interested in your brand, then jumping into the conversation, picking up that lead, and turning it into a sale, you can gain amazing results solely by identifying and engaging with prospects. Knowing what to search for when looking for your prospects can be tough. What are you even searching for? But in this case, it’s important to put yourself in your customer’s position. What type of people are the ones who are most likely to convert quickly when exposed to your brand? Those who have a pain point of course. But more importantly, a pain point that your service or product can help them solve. And how do you best find those who have a pain point? Those who explicitly say so in their tweets! What’s great about the advanced search is that it allows you to filter tweets by location. This is particularly helpful when you’re a local business wanting to reach individuals within your operating area. Finding people who are tweeting about something that implies that they may have an interest in your business won’t help you. You need to engage with them to make them aware of your existence, and that you can provide a service or product that helps solve their problem. The best way to engage with them is to reply to their tweet. The chances of getting attention is a lot better than if you would just like the tweet and hope to get discovered. Of course, the best is if you do it all: like comment, and mention them. This way you’ll maximise your chances of getting discovered. But how will you respond to them in a way that catches their attention and interest? One way is to provide them with discount and coupon codes. For example, if you own a coffee shop and find people who tweet “I am sooo tired, I need a coffee right now”, then these are the ultimate prospects if you know how to provide them with value that gets them to convert. Something that is always effective is to give them a personal experience. Not only will this allow you to build a better relationship with them, but it also helps give them a more personalized experience that makes them feel unique. For example, instead of sending them an ordinary coupon code, give them a coupon code that is their name. This will help your customer relationship both online, and in-store, and it will have more convincing power because the prospect will feel like they are obligated to give something back since you’ve given something to them. At least, that’s how humans work in theory. While not always as accurate or advanced as Twitter’s advanced search, keywords on Twitter never get old. Plus, they’re super easy to use! If you want to find people who are your potential customers, then obviously, you want to search for terms and keywords that are relevant to your industry and niche. When you want to find people within your niche, simply go to Twitter’s search bar and search for a term related to your industry. When you search for keywords, the keyword you searched for will be marked in bold text in the tweets that come up as suggested. But the tweets that are suggested will also come from the “top accounts” that has tweeted about that subject. Sure, it’s a great way for you to find competitors on Twitter, but maybe not as effective to find potential customers. Does this mean that this method doesn’t work if you want to find prospects who are tweeting about the subject tennis? Absolutely not! You just need to click in “Latest” instead! The last way to find prospects is to search for hashtags. 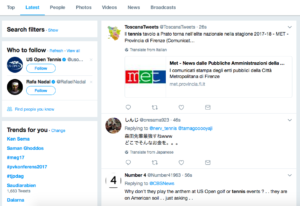 Hashtags is almost identical to if are searching for keywords, but the only difference is that you’ll put the hashtag symbol (#) before the keyword, and that way, you’ll only find people who have included the hashtag #tennis in their tweet, and not people who have just had the keyword tennis in their tweet. The same goes for here as it did with the keywords. 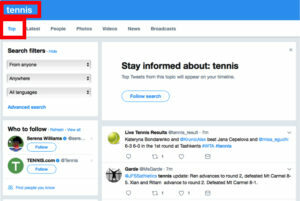 The search function will be auto set to “top tweets” which means that the tweets containing the hashtag tennis that has been posted by the top accounts will be presented. But as mentioned earlier, this doesn’t exactly leave us with potential customers, and therefore, we need to choose “Latest” instead. Twitter is a great tool for finding your target audience. It offers a ton of different approaches and methods that you can use to identify and target your audience. Follow these tips and you can be sure to reach people who are relevant to your brand and are potential customers.